2. Sign Up/Login to your Freecharge account and reach onto dashboard. 3. Initiate a recharge by inputting your number, operator and recharge amount or initiate a bill payment from available options. 5. If you are eligible, you will see a success message. 6. Complete the transaction with Freecharge Balance, Debit/credit card, UPI or Net banking. 7. Done!!! Your cashback will be credited to your account immediately. We share many more deals, coupons and discounts. Keep visiting !!! Minimum transaction is Rs 50. Flat Cashback of Rs 50. 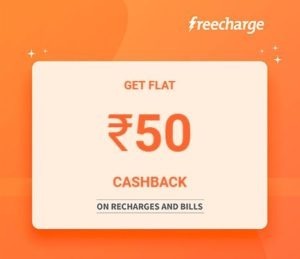 Cashback will be credited as freecharge balance and it has a validity of 1095 days.